LOW MILES, Driver Assistance Package, Cold Weather Package, Premium Package, Navigation, Rear View /Backup Camera, Hi-fi Sound System, Sunroof/Moonroof, Power Tailgate, Parking Sensors, Sirius/XM Satellite Radio, Heated Steering Wheel, Heated Seating, Leather Seating, Power Seat(s), Keyless Entry/Start, Bluetooth/Handsfree, IPod Adapter/MP3 Player, & MORE. CARFAX One-Owner. Clean CARFAX. Odometer is 5577 miles below market average! 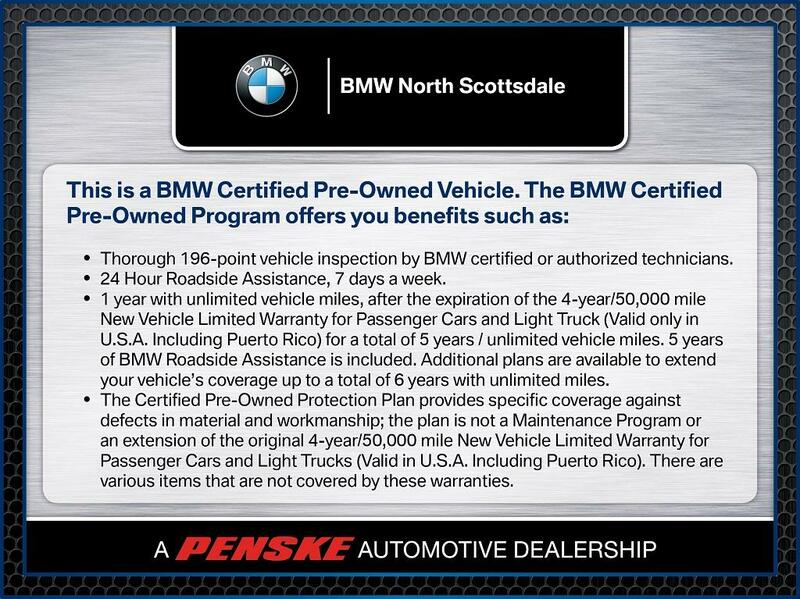 21/28 City/Highway MPG BMW Certified Pre-Owned: Covers you for 1 year with unlimited vehicle miles, after the expiration of the 4-year / 50,000 mile New Vehicle Limited Warranty for Passenger Cars and Light Trucks (Valid only in the U.S.A. Including Puerto Rico) for a total of 5 years / Unlimited vehicle miles. 5 years of BMW Roadside Assistance is included. Additional plans are available to extend your vehicleâ€™s coverage up to a total of 6 years with unlimited miles. The Certified Pre-Owned Protection Plan provides specific coverage against defects in material and workmanship; the plan is not a Maintenance Program or an extension of the original 4-year/50,000 mile New Vehicle Limited Warranty for Passenger Cars and Light Trucks (Valid in U.S.A. Including Puerto Rico). There are various items that are not covered by these warranties.